In October 2001, ASTC’s Board launched a field-wide Equity and Diversity Initiative to attempt to bring balance in the disparity between the diversity of our society and the diversity of professional staff, audience, and board members of the science center field. 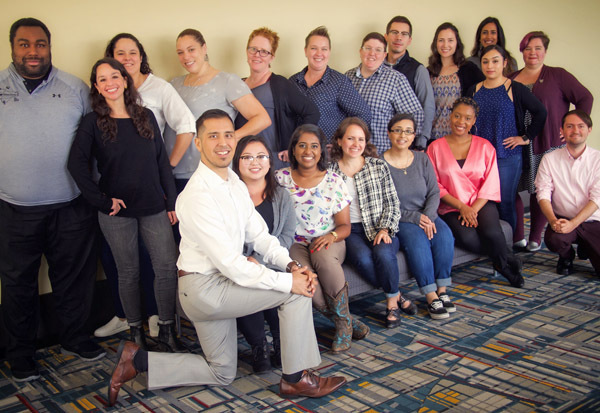 The primary activity for addressing this disparity is the ASTC Diversity and Leadership Development Fellows Program, originally designed to support the professional growth and retention of professionals of color currently working in the field. In response to the ever-changing nature of equity and diversity issues, eligibility criteria have been expanded and now include science center professionals from ethnic/racial minority backgrounds; with disabilities; and who identify as lesbian, gay, bisexual, transgender, queer, intersex, or asexual (LGBTQIA). To date, more than 200 science center professionals from nearly 100 science centers and museums in the United States and Canada have participated in the program. Fellows selected in this competitive application process will receive more than 25 hours of year-round, customized professional development; a free registration for the 2019 ASTC Annual Conference in Toronto; reimbursement of up to $1,500 in conference-related travel, lodging, and meals; and more. ALUMNI Fellows: Did not receive alumni fellowship in the previous year and have been included in an ASTC Annual Conference session proposal, this year or prior years. New and Alumni Fellows will use the same online application portal at the “Apply Now!” button below. (Optional) Supplementary materials that might include excerpts from publications, awards, program information, or letters of recommendation that demonstrate your dedication to the field and diversity work. Pro Tip: Before completing your online application, download this scratch pad and draft your answers; you may want to save a copy of this for your records. Pro Tip: Get your Applicant and Institution Statement of Understanding signed now! Don’t let those signatures delay your application. Click on the button below to begin your application. Select “Register” in top right corner. Create account by filling out information. Follow prompts to find and apply for 2019 Diversity Fellows program. Proceed to application portal to answer questions and upload all necessary materials. Review your application, download a copy if you wish, and hit “Submit” by 11:00 p.m. on Sunday, May 12. Pro Tip: The online system will send notification emails to your registered account. Look for them in your spam folder, if needed. Questions? Contact ASTC’s Ann Hernandez. Selection: In this competitive process, a panel of reviewers familiar with the science center profession and diversity issues will review the applications. The panel will select this year’s Fellows based on evidence that the applicants are committed to promoting equity and diversity, have long-term visions of themselves in the science center field, and are at places in their careers where they will benefit from this experience. 2019 Fellows will be announced in June.